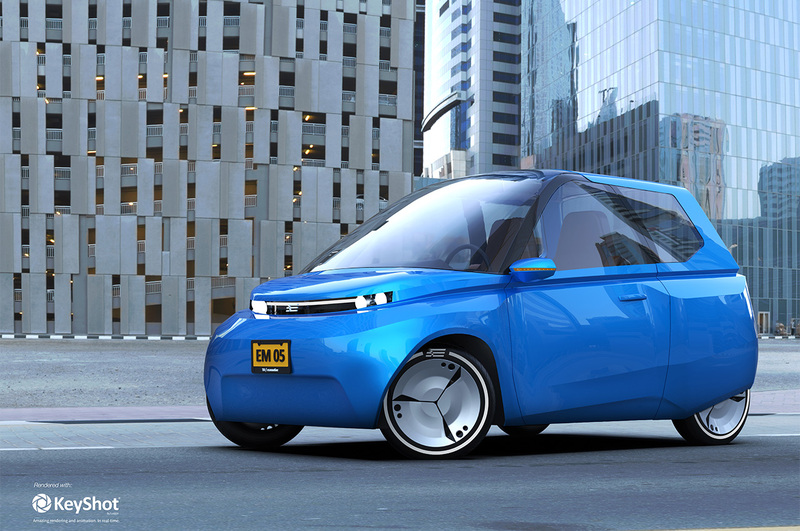 Noah is a fully electric city car and seats two people. Just as his big sister, Lina, his chassis, body panels and interior are made from a biocomposite with as main component flax. The biocomposite of Lina has been reinvented this year to be even more sustainable in both production as recyclability. For this year the matrix of polypropylene has been replaced by a matrix of PLA (sugar). With this adaptation, the biocomposite will be produced with materials that are over 90 percent made from renewable resources. The chassis will be constructed out of a sandwich panel combining the biocomposite with a honeycomb structured core from sugar (PLA). Due to the fact that the entire sandwich panel only consists of two materials (PLA and flax), it is now fully recyclable. The circular economy was a leading concept during the design process of Noah that focuses on sustainable production, use and in the end the level of recyclability. With Noah only weighing 350 kilograms, he can drive very efficient. The complete drivetrain has been optimized and with a gearbox called “Smesh Gear” which will reach an efficiency of 97% (!) during acceleration and even a 100% efficiency at constant speeds, this makes the entire drivetrain of Noah incredibly energy efficient. The electromotors are powered by six modular batteries that enable easy battery swapping and the possibility to gradually introduce better battery technology when available. For Noah to be future ready he is equipped with NFC scanners in the doors which make him perfect for carsharing. With this NFC scanner, the door can be opened by any mobile device, Noah will immediately recognize the user and set the car to his or her personal preferences. During the following months, we will focus on building the car together with our partners and apply for a license plate later this year. Noah will be ready in July 2018 and will be driven to the public during the summer of 2018 when we take Noah on a trip to several major cities in Europe. Noah will be the next step to what we think is the car of the future.